As you prepare for student teaching, you may have come across some student teaching blogs. These blogs act as a journal for people going through student teaching. They describe some of the problems that they faced and how they worked through them. They also share lesson ideas that were successful or epic failures. You can learn a lot from these blogs, but you can also learn a lot from keeping your own blog during student teaching. If you decide to create a blog, use these tips to help you get going. Blogger. It allows you to choose a name for your blog. Then, start writing right away. They offer lots of ways to customize your blog, too. WordPress. 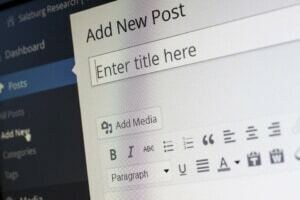 Similar to Blogger, you can use WordPress to write your blog. You can also purchase your own domain name, and use WordPress to write the blog entries. Posthaven. This one is different from the others because you can submit your posts by email. This also makes it easy to have guests write blog posts. Get in the habit of posting on a regular basis. It’s a great way to journal about your experiences. You can keep it private and use for your own personal reflection. However, consider making it public so others can learn from your experiences, too. You don’t have to post every day. You might feel too busy to sit down and blog every day anyway. Just aim to post 3 times every week. If you want to get more people to follow your blog, try connecting it to one or more of your social media accounts. If you have a Facebook, Twitter, Instagram, or Pinterest account that you can connect to your blog, then do it! Of course, it’s best to choose social media accounts that focus on teaching, such as a teaching Pinterest board. If your blog is going to be made public, then you need to be careful about how you speak about your students, their parents, your cooperating teacher, and other colleagues. Don’t use their names or any identifiable features that will help others figure out who you’re talking about. Try to stay positive and keep things civil. Whether you’re using the blog for your own personal reflection or to draw others to your site, there are lots of great reasons to create a blog. Review other student teaching blogs for inspiration and to help you find your voice. Student Teaching Survival Kit: What to Include?